It was like 2AM and I had been checking short Japanese compositions on Blackboard, explaining in words that もってくる and もっていく are not interchangeable, and that I think it’s weird that many people seemingly use “take” and “bring” interchangeably in English. What a jumble of words, I thought, and deciding that pictures would make things far easier to understand, I busted out my ancient Wacom tablet and launched Photoshop Elements 8. I only lasted one panel holding the shift key to make straight lines before deciding it would be better the worse it looked. ありがとう！あしたリンゴを大学にもっていきます。Thanks! 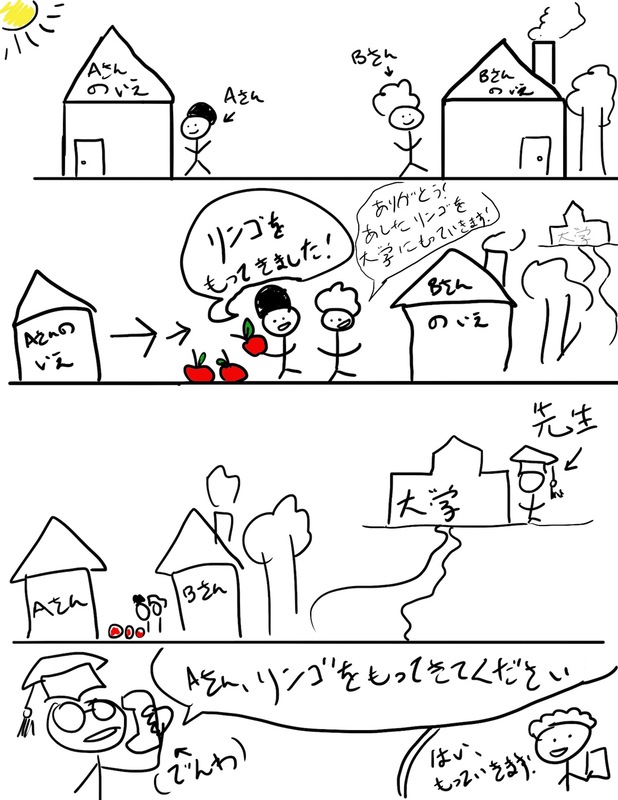 I’ll take the apples to school [university] tomorrow. はい、もっていきます。Yes, I will take them. At least, that’s how I would translate it. From conversations with students, I gathered many people wouldn’t find it strange to replace every instance of “take” in my translation with “bring.” As far as the dictionary’s concerned, they’re not wrong, apparently. It’s like how we say, “Come here,” and “Go there.” “Go here” would only make sense if you’re telling someone to relieve themselves at a spot physically near you, or if you were pointing to a map and indicating a point on the map which is near you. No one would ever say “Come there.” The directionality is wrong, right? Do you think it’s weird to use “bring” even you’re not at the place you’re referring to? In any case I’m reminded of previous stick figures I’ve mobilized for the sake of Teaching People Why It’s This Word Not That Word. I didn’t always take pictures of them. 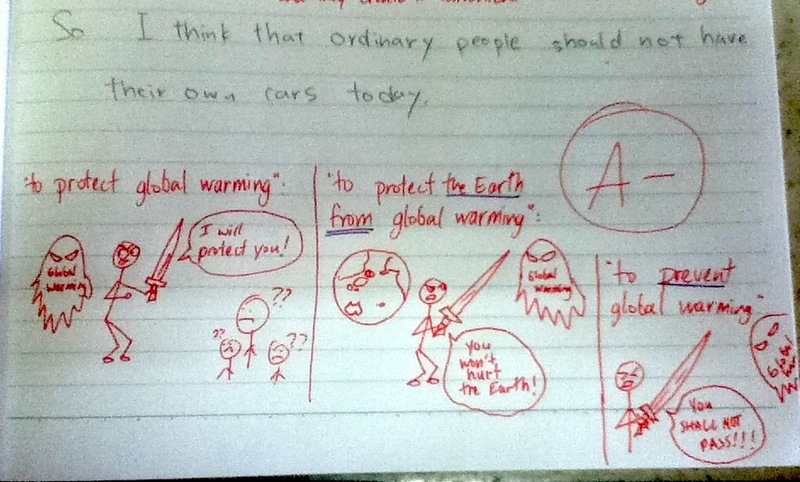 Mostly only when I was starting to get tired and not care if students thought I was crazy so I’d draw whatever. 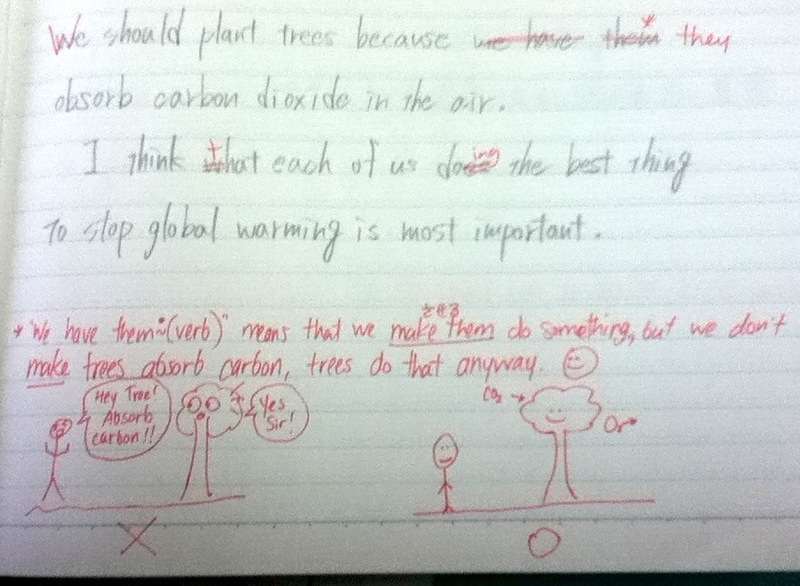 The tree’s expression gets me every time. Hopefully this one’s been cleared up. But I haven’t literally hugged a tree in a while. I need to go do my part. 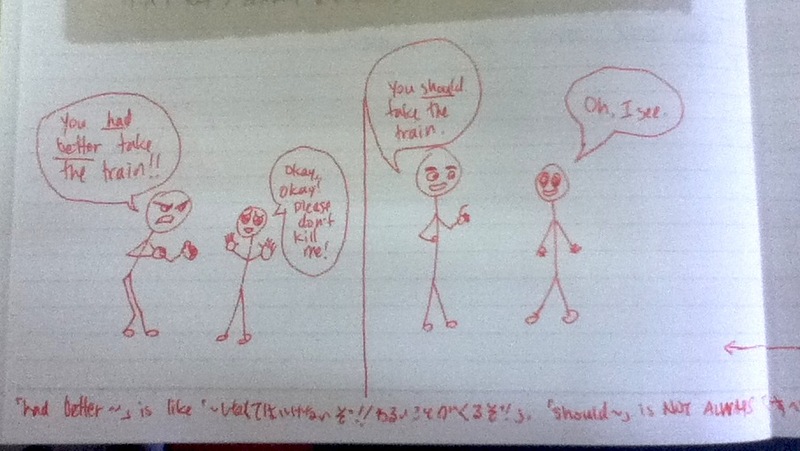 Tags: English grammar, Japanese grammar, stick figure comic, stick figures. Bookmark the permalink. Sorry this reply is so late! Speaking of exams, it was midterm time and I like to give my students their tests back in the very next session so I was busy writing the test then checking it. No matter how much I think about it, “bring” feels wrong unless you’re physically at the place you’re referring to.